DISCONTINUED. Quiet and efficient the wall-mounted Glow-Worm Betacom2 24kW combi boiler is easy to install service and maintain and comes with a parts and labour warranty for 2 years. 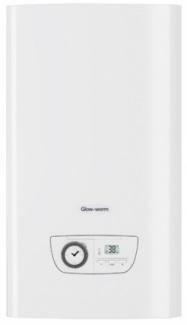 Designed to meet the heating and hot water requirements of small to medium sized homes this gas combi boiler is LPG compatible to address the needs of households not connected to mains gas. In addition to the 24kW version the boiler is also available with a slightly more powerful 28kW output. Comprising of a standard horizontal flue a built in analogue timer stainless steel heat exchanger and an LCD display it's of an average size for a wall-mounted combination boiler. Measuring 74x42x34 it will fit in a standard kitchen cupboard. You'll probably want to upgrade to a more advanced programmer for greater control of your heating and hot water. The built in timer isn't especially flexible; it can't be set individually for different days of the week. The Energy Savings Trust recommend this boiler. This product is also available in the Betacom3 range which you can find here and has a slightly better efficiency rating.